The parish extends from Crossway Green in the north to Hawford in the south and from the river Salwarpe in the east to the Severn in the west. At Hadley, next to a 16th century inn, is a bowling green, claimed to be the oldest in the UK. (But the claim is contested by Southampton Old Bowling Green, which claims to be the oldest bowling green in the world, in use since 1299). Examination, removal orders, settlement papers & other papers of the parish officers 18th & 19th cent. Examination papers, apprenticeship papers, removal orders 17th, 18th & 19th cent. OMBERSLEY, a parish in the lower division of the hundred of OSWALDSLOW, county of WORCESTER, 4¼ miles (W.) from Droitwich, containing, with the townships of Borley, Hadley with Hay-Elms, Mayeux with Chatley, Northampton-Parsonage with Powers, Ombersley, Sychampton with Brookhampton and Comhampton, Uphampton, Winnall with Acton and Dunhampton, 1814 inhabitants. The living is a discharged vicarage, in the archdeaconry and diocese of Worcester, rated in the king's books at £ 15.7. 3½ , and in the patronage of the Marchioness of Downshire. 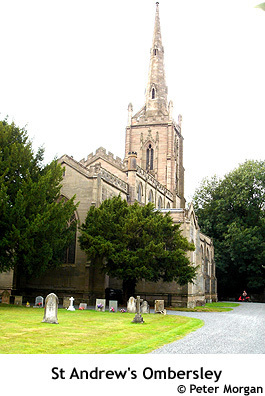 The church, dedicated to St. Andrew, has lately been rebuilt, in the later style of English architecture, and is now one of the most elegant in the county: in the churchyard are the remains of an ancient cross, supported on steps. The river Severn passes through the parish. Here was formerly a market, granted by Edward III, but it has been long disused. A charity school was founded, in 1701, by Thomas Tolley, to which Thomas Baker, in 1722, bequeathed £100, and Richard Lloyd, in 1723, liberally endowed it with land and houses.